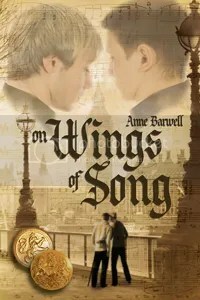 Cover Reveal: On Wings of Song by Anne Barwell! This cover is amazing… and have tissues handy when you get to the excerpt. This entry was posted in For Your Reading Pleasure and tagged Anne Barwell, cover reveal, Dreamspinner Press, historical, MM Romance by Charley Descoteaux. Bookmark the permalink. Glad you like the excerpt, Charley. Thanks again for hosting my cover reveal.